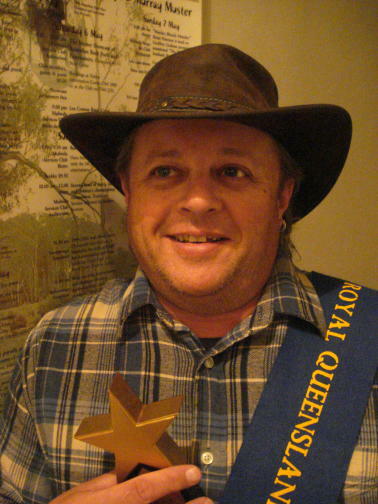 JAM - NSW Folk Federation - Rhymer "Poles Apart" at the "Ekka"
Rhymer "Poles Apart" at the "Ekka"
13 proved far from unlucky for Graeme Johnson, “The Rhymer from Ryde” at this year’s Royal Brisbane Show Bush Poetry Competition. The event is run annually in early August as part of the “Ekka” and has been held in QLD since 1876. This year was Graeme’s 13th at the site and over that decade or so he’s come up with 10 awards (including this year’s)! 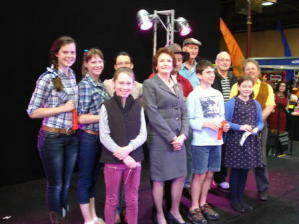 Bush Poetry at the “Ekka” has been run for nearly 20 years at the Show by local identity & icon Trisha Anderson. Every year she musters Poets from all over Australia who gather at the various pubs, auditoriums, halls and venues around the site to ‘spruik’ a bit of good old fashioned “Aussie” Bush Verse to the assembled masses. Major renovations at the site and surrounding areas (which will continue for a decade or more) did nothing to halt the advance of the crowds who poured through the turnstiles at a record breaking ‘rate of knots’ to ‘have a squiz’ at the brand new Convention Centre and many other changes. The Bush Poetry competition (held in the heritage listed John Reid Pavillion) once again attracted established performers from all over the country vying with all their skills to take home one of the coveted prizes. A grand mixture of serious, comedic, original & contemporary poetry was showcased during these performances keeping the crowds enthralled for hours on end. Graeme’s First Place in the Original Section was for his poem “Poles & Wires” a piece about the “Light Horse Interchange” sculpture that can be found in Sydney’s western suburbs. The sculpture is a memorial to the Light Horse Regiment of WW1 & their valiant horses.